This course is a Physical Science course with lab exercises. This course is typically taken in 8th or 9th grade, and is usually the last science course before the high school sciences (physics, chemistry, and biology). At some schools this course is referred to as an Intro to Physics and Chemistry, although it also include some astronomy and earth science. If taken in 9th grade, schools would typically count this course as a high school science credit. When this class is taught live, class time is primarily spent on instruction. Students bring their Student Workbook to each class, or a printout of the pages for that week. The pages of the workbook are identical to the instructor's lecture notes, except the student version has the solutions and answers deleted. During the lecture the students take notes and solve the example problems in the workbook. Videos of the lectures are also available online, and these videos go through the same lecture notes, point by point. Students use the videos to cover any material that time constraints did not permit us to cover in our weekly class. Or, if a student misses a class or needs to review the material, all of the course content is available online. Distance leaners take the entire class online, but receive the exact same course content as they would in a live class. The complete content of this course is in the lecture notes and videos of the lectures, in the Student Workbook, and in the supplemental readings. Separate textbooks are no longer necessary. 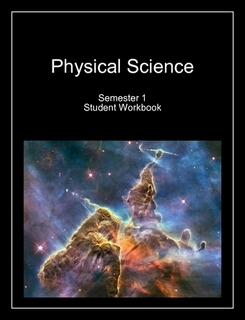 Originally written for a group of students in California, this course was based on the California text Focus on Physical Science and also on Paul Hewitt's Conceptual Physical Science. Students will be given specific assignments to complete each week. Assignments will consist of Practice Problems from the workbook, instructional videos online, and written assignments. In this class there is a distinction between Practice Problems and Homework Problems. Practice Problems are found in the workbook, and students check their answers with the solutions provided. Homework assignments and tests are printed from the website, completed, and turned in for a grade. To maximize instructional time in class, tests will be given at home. One final exam for each semester will be taken in class at the end of each semester. Students will receive a numerical grade for each semester and for the year. The grade is calculated based on tests, graded homework and the final exams. Access to a computer with a high speed internet connection is strongly recommended. Instructional materials such as lecture videos, lecture notes, homework assignments and tests will be available over the internet. Graded assignments and tests may also be returned via email in order to provide more timely feedback. Progress reports will be put on the website and updated regularly. Derek Owens graduated from Duke University in 1988 with a degree in mechanical engineering and physics. He taught physics, honors physics, AP Physics, and AP computer science at The Westminster Schools in Atlanta, GA from 1988-2000. He worked at the TIP program at Duke for two years, teaching physics and heading the Satellite Science Program. He received a National Science Foundation scholarship and studied history and philosophy of science at L�Abri Fellowship in England. He worked as a software developer for six years before returning to teaching. Since 2006, he has been a full time teacher for homeschoolers in the Atlanta area. He and his wife Amor and their two children Claire and David attend Twelve Stone Church, a non-denominational church near their home in Norcross, GA.